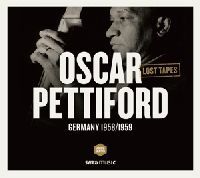 In Stuttgart, Pettiford met up with Joachim-Ernst Berendt, who invited him to studio recordings and enlisted the finest soloists Europe had to offer at the time: Hans Koller and Attila Zoller; Dusko Goykovich, Hans Hammerschmid, Rolf Kühn. Kenny Clarke and Lucky Thompson flew in from Paris. Everyone extolled his bold melodic ideas, the bounce and swing of his playing. Between autumn ‘58 and the summer of ‘59, the sessions resulted in historic recordings – standards, mostly, which gave the alternating ensembles a harmonic orientation. Pettiford’s brisk but elegiac duo with Goykovich in Gershwin’s But Not For Me; gossamer-like, Lucky Thompson in Sophisticated Lady, followed by Koller with an über-cool interpretation of The Nearness Of You and a bass solo; then Pettiford shows his cello skills in All The Things You Are. O.P. moved to Baden-Baden, later Copenhagen, touring and playing frenetically – like a man possessed. He died following a car accident in September 1960. His colleagues played charity concerts for Pettiford’s children, whose welfare had always been his primary concern – he himself had been one of fourteen brothers and sisters.